Chiropractic adjustments focus on the integrity of the spine’s 24 spinal joints so the housing and protection of the vital neurological communication can take place without interference. 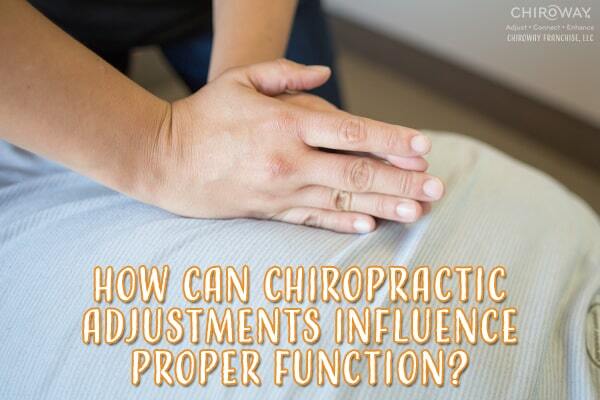 Each chiropractic adjustment you receive can help remove interference in the impulses traveling from your brain to the rest of the body, or from the body to your brain. All of your brain-body communication takes place through the spinal cord and throughout the neurological system. When dysfunction (misalignment and or improper motion) is located within the spine due to vertebral subluxation, the communication is less than optimal between brain and body. This can create less than optimal function in the body’s neurological system therefore interfering with the body’s innate healing characteristics. Your body’s innate healing characteristics repair and heal itself through the power and influence of your neurological system. How can you prove this innate characteristic? One way is to look at the placebo effect. The mind-body connection in the placebo effect shows how the neurological system plays a vital part in complex neurobiological reactions that are necessary for normal function to occur. A specific chiropractic adjustment can help restore proper relationship within the joint and surrounding tissue which can enhance the innate healing characteristics of the body due to the emphasis on the relationship between structure and function that is coordinated by the neurological system at the spinal cord level. Visit your chiropractor on a regular basis to help keep your body’s innate healing characteristics at their best.